Omegle is a random web chat service often used to find partners for cybersex encounters. GoodguyGastly is using it to help him defeat the Elite Four in Pokémon Omega Ruby. He’s a very brave man. 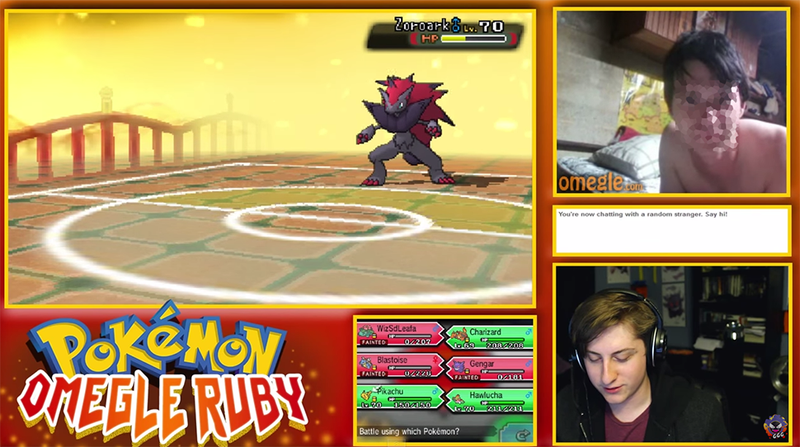 Unlike Twitch Plays Pokémon, in which random chatters offered up command inputs that were parsed and communicated to the various installments of Nintendo’s franchise, all Omegle Plays Pokémon wants is help selecting which moves to use to take down Sidney, the first of Omega Ruby’s Elite Four. To do that, all he has to do is capture the attention of random people on Omegle, many of whom would probably rather see his junk. “I had to go through a lot of...things... to make this” says Goodguy in the video description of this first installment. I can only imagine these things. Well, except for the girl in cat ears, the girl nibbling on her boyfriend, dancing man and the one naked guy. I look forward to seeing more from this series, but hopefully not much more.